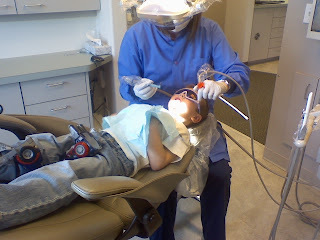 I finally took Aaron into the dentist. I know this sounds bad being that he is 4 and a 1/2 and I'm a daughter of a dentist and should know better. But come on, what do they really do before that anyway. Some call it "getting used to the dentist." That is all fine when your 18+ month old can sit still long enough. Aaron, not so much. There was no way he would have been able to do this even 6 ago. . He did have 3 cavities (bad mom!! 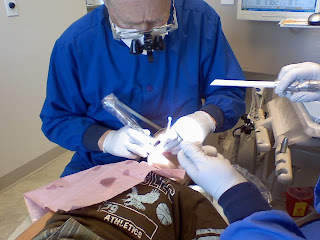 ), but in my defense they were really small cavities. I was so amazed how quick he filled them. I'm talking maybe 5-10 minutes tops per cavity. He had a total of 3 appointments and did amazing every time! I was so proud of him. Appointment #1. X-rays and a simple cleaning. Notice that Optimus Prime had to come along for support! Appointment #2. 2 cavities down and 1 to go. I recommend laughing gas for every dental appointment! It was a life saver for Aaron. I don't have pictures of the last one, but you get the idea. 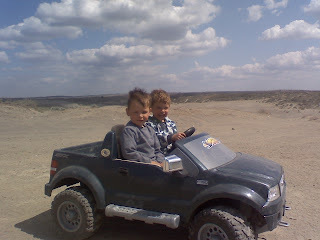 A couple of weeks ago my friend Jen invited us to go to Juniper Dunes for a couple of hours to let the kids run around and get dirty. Her husband has 4 wheelers and they go out there often and camp out. 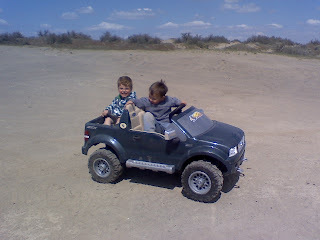 We'd thought it would be fun the take the power wheels and let the boys participate some what. 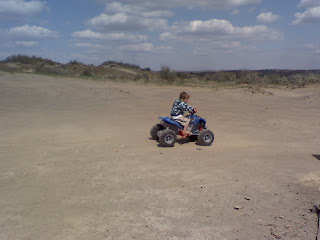 This is Aaron on Will's Power wheel. I promise it's not a real 4 wheeler. I would never let him ride one without a helmet on!! Last month my good friend Andrea had her baby shower for baby boy #2. Who knew we'd both end up with 2 boys. I get tired just thinking about it. The shower was really laid back. The fun part about it was that our friend from high school was there too. We just came back into contact with her and it was fun to be together again. We had fun catching up and eating, because that's what you do at shower's...EAT!! I only took one picture, but it's a good one. From left to right: Sandy, Me, and Andrea. I am the only one not pregnant. Literally, every girl I know is pregnent or just had a baby. Crazy. Oh, did I mention I have to wear glasses now?!? Despite the fact that I had to work the nights before and after we had a pretty relaxing Easter. Saturday the 11th my hospital puts on an Easter egg hunt every year. Aaron loves it and it was really fun to see Wyatt enjoying it this year too. The kids get separated by age groups and just go at it. Then there's activities inside after. We met up with my good friend Jen who has kids the exact same age. 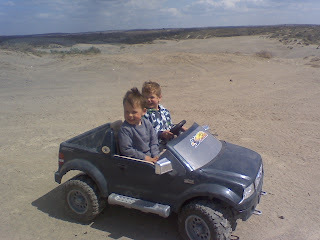 The mom's went with the babies and the dad's went with the big boys! Unfortunately each family only had one camera. So I got to take pictures of Wyatt and Stella and Jen's husband took pictures of Aaron and Will. I don't have their pictures yet and I haven't given them a copy of mine yet either.So here are a few pictures of Wyatt and his friend Stella at the Easter egg hunt. Wyatt got bored really fast and started to go to the playground and eat rocks! Boys!! !